The Statue of Liberty officially reopened last weekend to huge fanfare after a $30 million refurbishment, but it has now been closed indefinitely after Superstorm Sandy flooded its island in New York Harbor, as inspectors conduct a full assessment of any possible structural damage. The public have been restricted to the grounds on Liberty Island over the past year, but Interior Secretary Ken Salazar and a U.S. Military Academy cadets group were the first to visit last Sunday. However, that was before the storm – and although the New York City statue was expected to reopen on Wednesday, that was delayed after Hurricane Sandy hit and killed at least 98 people in the US and Canada. The renovation included replacing the stairs to the crown, as well as creating wheelchair access to one of the observation decks at the top of the pedestal. But the statue was closed again on Monday. Federal inspectors will be carrying out checks this Saturday to Liberty Island, and its neighbor Ellis Island, although a quick examination showed no damage to the statue or the Ellis Island museum. But a National Parks Service spokesman told the New York Daily News there was “water damage to the Statue of Liberty site” and said checks must be done before a reopen date can be established. Elsewhere in New York City, museums, the Empire State Building, Broadway theatres and many stores reopened on Wednesday to the relief of tourists stuck in hotel rooms since last weekend. This year marked the 126th anniversary of the Statue of Liberty’s dedication and the renovation improved fire alarms, sprinkler systems and exit routes to bring it in line with city safety codes. There are also more stairs than ever before, with a daunting 393 steps to the crown, where there were previously 354 slightly steeper steps. The famous statue is 151 ft from base to torch. It sits atop the 89 ft tall stone pedestal, which sits on a 65 ft tall foundation in the shape of a star. Meanwhile the bathrooms have been upgraded for the first time since the 1980s. In addition, a new air-conditioning system will cool the interior of the copper-clad monument, which previously could get up to 20F hotter than outdoors at the height of summer. About 3.5 million people visit Liberty Island each year, although most don’t go inside the statue. With the improvements, 26,000 more will be able to ascend to the crown each year. The statue, a gift from France to the US, was dedicated in 1886 and declared a national monument in 1924. In 2009, the crown was reopened to the public for the first time since the 9/11 attacks. Superstorm Sandy was blamed for at least 98 deaths across the US and Canada, leaving New Jersey’s barrier islands a wasteland of eroded shoreline, ruined beachfront homes and flooded streets. As New York City came back to life yesterday, starting with the partial reopening of subway routes three days after the storm, it was revealed the total U.S. damage could hit $50 billion. Designed by Frederic Bartholdi, the statue is a neo-classical sculpture based on the Roman Goddess of Freedom, Libertas. The statue was a present to the United States from France to celebrate independence and was erected in 1886 in Upper New York Bay on Liberty Island. Frederic Bartholdi’s inspiration for the statue was a comment made by politician Édouard René de Laboulaye in mid-1865. Statue of Liberty makes for a truly exhilarating sight for anyone entering New York. The main body of the statue stands at 151ft high, but with the pedestal included, reaches 305ft. 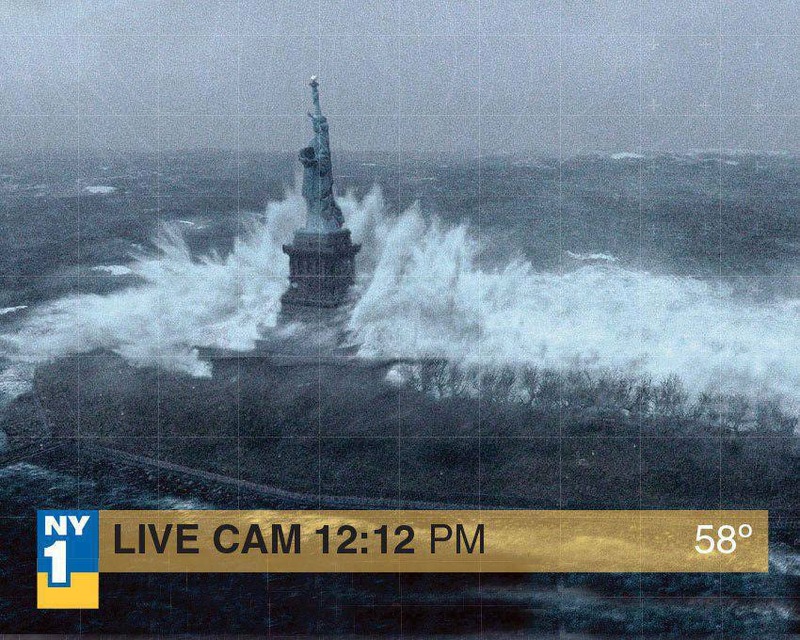 Statue of Liberty has been featured in several Hollywood films such as Independence Day, Cloverfield, The Day After Tomorrow and Planet Of The Apes, where it appears buried in a beach.